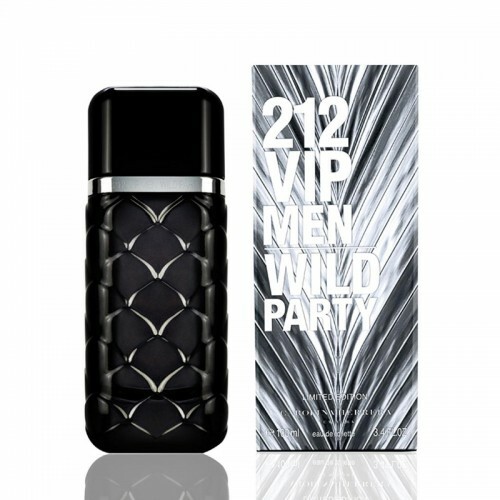 Carolina Herrera 212 VIP Men Wild Party reflects the image of a passionate. Carolina Herrera 212 VIP Men Wild Party 100ml. Eau De Toilette reflects the image of a passionate, extravagant and stylish man. Woody-spicy combinations of chords in the perfume have a charismatic and elegant character. The initial note is energetic and explosive black pepper. The middle notes are represented by the contrasting cool-grassy, ​​damp smell of violet leaf. The base of the perfume is a multifaceted and rich wood accents. The fragrance is placed in a stylish black vial of oblong form, which is decorated with convex scales that mimic the skin of the python. The perfume favorite of modern young men is 212 from the famous American brand Carolina Herrera. His emotional shimmering was to the liking of energetic and bright personalities, hurrying to conquer new peaks and bright unforgettable impressions. In 2016, the brand pleased the fans with the release of a new limited edition of 212 VIP Men Wild Party. The top citrus notes are revealed by the freshness of lime roe and iced apple punch and hot pepper. In the heart of the fragrance, the cool notes of violet leaves set off the heat of black pepper. An unusual contrast makes the fragrance attractive and extravagant. The sturdy sound of the basic woody notes leaves a spicy sensual plume. The Carolina Herrera brand is named after its founder, the famous Venezuelan fashion designer. The first perfume of the same name appeared in the market eight years after the establishment of the company - in 1988. However, the biggest fame was the smell of "212". If you are interested in what those numbers mean, let's know that this is the phone code of New York's Manhattan, which Caroline literally fell in love with.